The first high-speed rail tunnel linking the Chinese mainland and Hong Kong has been cut through. The 3,886-meter tunnel runs from Shenzhen City, south China's Guangdong Province to the Mai Po district of Hong Kong. The Shenzhen section of the tunnel has been constructed to Chinese standards, with the section in Hong Kong built under European standards. Wu Xiangong from the China Railway Group Company which is responsible for the construction of the tunnel's mainland section, said "We realized seamless joint of Chinese standards and European standards in the two rail tunnel sections and we can use the experiences in future opportunities of tunnel constructions in Europe and even America. And through this practice we can find some ways that conform to the 'going global' strategy." 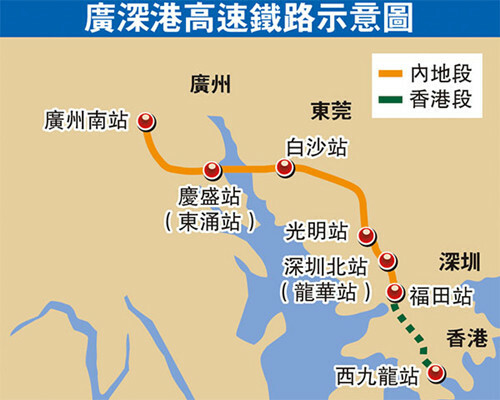 The project is part of the underground high-speed rail linking Shenzhen to Kowloon. Hong Kong will construct the Mai Po-Kowloon section. The Shenzhen-Kowloon high-speed rail will be connected to the already operating Beijing-Shenzhen rail line. The journey time from Beijing to Hong Kong will be cut from the current 20 hours to around nine hours.